Raymond Delious Reed, 104, of Martinsville, VA passed away Sunday, November 11, 2018 at Stanleytown Health and Rehab Center. He was born January 9, 1914, in Rich Creek, Giles County, VA to Levi and Martha Duncan Reed. In addition to his parents and five siblings, he was preceded in death by his beloved wife of 64 years, Mildred Bradley Reed. Mr. Reed served in the United States Army during WWII and received a Purple Heart. He worked as a butcher at numerous local grocery stores. He was an avid gardener, skillful cook, and devoted grandfather. 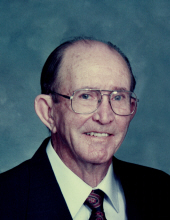 He was a member of McCabe Memorial Baptist Church. He is survived by his son Noel and daughter-in-law Linda Barker Reed, who were his devoted caretakers; son Leon Reed, and granddaughters Stacey Reed and Julia Reed. A funeral service will be held at 2 p.m. on Tuesday, November 13, 2018 at Norris Funeral Services, Martinsville Chapel with Dr. G.H. Vaughan officiating. Visitation will be prior to the funeral service from 1 p.m. to 2 p.m. Burial will follow at Roselawn Burial Park. In lieu of flowers or food, memorial donations may be made to McCabe Memorial Baptist Church, 107 Clearview Drive, Martinsville, VA 24112. To send flowers or a remembrance gift to the family of Raymond Delious Reed, please visit our Tribute Store. "Email Address" would like to share the life celebration of Raymond Delious Reed. Click on the "link" to go to share a favorite memory or leave a condolence message for the family.